LG has shown off the next generation of e-book at a conference in the US by bringing an 11.5-inch touchscreen e-paper display. It has been on display at the Society for Information Display (SID) International Symposium, where users have been able to try out the new technology. It only works in black and white and appears to have a limited level of flexibility, so it's not quite at the level of being able to roll it up and stick it in your pocket when not in use. 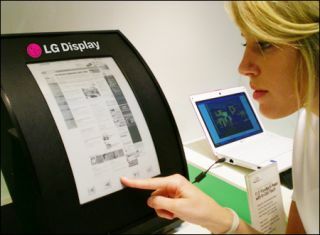 That kind of technology is what we're waiting to see from the likes of Polymer Vision, which is still delaying its rollable 'Readius' display, and Plastic Logic has a similar idea to LG, but isn't going to be able to bring its flexible reader out until 2010 at the earliest. We've contacted LG to find out when this flexible e-reader will be hitting the shelves (if ever) and we'll let you know with frenzied excitement if we get confirmation.